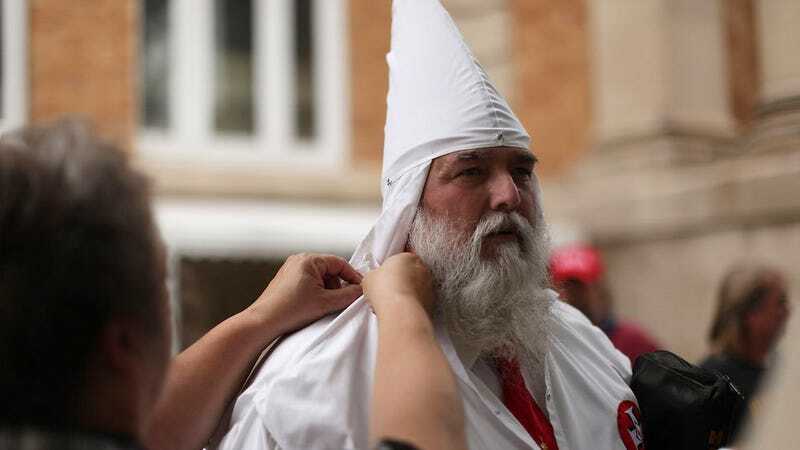 Following Donald Trump’s win in the 2016 presidential race, the Ku Klux Klan has announced plans for a celebratory rally in North Carolina, an important swing state in which Trump ultimately received 51% of the vote. The group was behind a rally in South Carolina last year protesting the removal of the Confederate flag from the state Capitol building. Just look at America the Country that our forefathers fought and died for. They tried to make a white Christian homeland for its people. Which they did our people knew the value of its blood. We as a people knew not to mix with the darker races our own Government knew the downfall of what would happen if we did. They even had laws to prevent race mixed marriages on the books until 1959. It was not until the late 70's to mid 80's you really started to see mixed couples in the streets of America. Even then it was still rare it was more around the early 90's is when this trend started to spread. Most of our youth are on DRUGS or pregnant with a mongrel child. If our forefathers could see America today they would have our Government Leaders put to DEATH. For Treason against the American people. They are rolling in their graves as you read this now. We as a people can change this course in which America has taken. We need to come together as WHITE CHRISTIAN AMERICANS and spread the word to others. Grab the blind Liberals by their heads and shake them until they wake up. From their JEW TUBE naps and tell them to look around because the ship is sinking. And through the Ku Klux Klan we will wake America up to the evils which are in our Government. We will unite proud white Americans to our cause because we have the LORD on our side. And with CHRIST we can’t lose. So if you are White and proud join the crowd join the Loyal White Knights of the Ku Klux Klan TODAY!!!! Pro-tip! If you really want to prove white supremacy is a real phenomenon, maybe start by building a readable and functioning website. Contacted by Snopes, a spokeswoman named “Amanda” confirmed that the parade was real, but denied that they had any involvement with the small conservative rally that occurred in Mebane, North Carolina on Election Day. “TRUMP’S RACE UNITED MY PEOPLE,” declares the the KKK website. Racists and bigots, united at last.